Most dogs will dig a hole at some point in their lives. However, some dogs are more prone to digging than others. In these instances, an owner’s yard can quickly turn into a hole-filled lot that is both dangerous and an eyesore. Understanding why dogs dig and how to solve these problems will be discussed. If your dog is frequently left in the yard alone, he or she may have realized that digging holes in the garden receives attention. Regardless of whether the attention is negative or if digging results in an invitation to come inside, your dog may be using digging to spend more time with a favorite human. Anxiety can manifest in a number of ways, including digging. When a dog is suffering from separation anxiety, the primal urges to dig and escape are common. If your dog is left alone in the yard and also exhibits behaviors such as pacing, escape attempts, and incessant barking, anxiety may be to blame. Additionally, dogs that have general anxiety (such as the type that stems from being near unpredictable animals or children) may also dig to relieve stress. If your dog is not receiving proper outlets for pent-up mental and physical energy, boredom can easily occur. 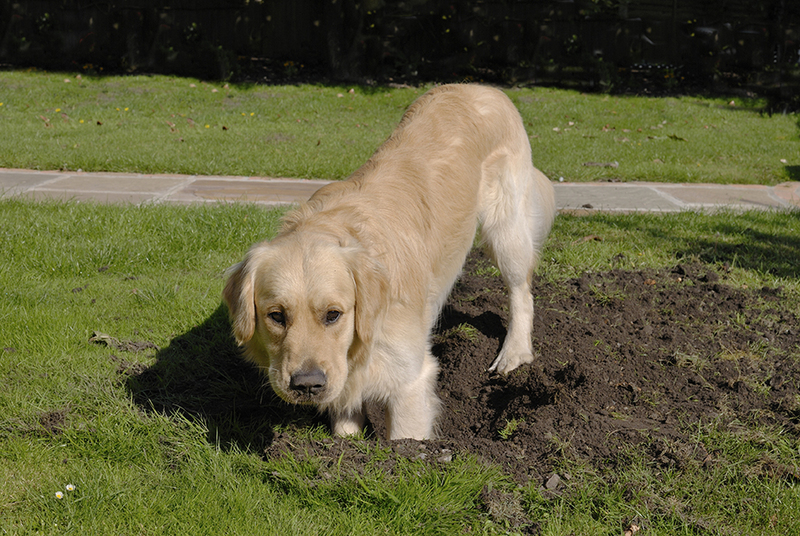 Digging (along with other nuisance behaviors like barking and chewing) is one way that dogs release stored energy. Some dogs may dig in an attempt to escape. This behavior is common among certain breeds, such as Siberian Huskies, that have a natural drive to wander. Additionally, female dogs in heat or intact males who sense nearby females are also more likely to try and escape an enclosure. For dogs that are prone to overheating, digging a hole can help with heat regulation. The dirt inside a hole is naturally cooler than the air above the ground, and an overheating dog may use digging as a last resort. Of course, dogs will dig in order to bury their treasures. Whether wanting to bury a bone, a favorite toy, or an unlucky squirrel, dogs have a natural drive to want to bury favorite items to save for later. Some dogs have a natural drive to hunt animals underground. For instance, Jack Russell Terriers and Dachshunds are natural mole hunters. These dogs want to dig for the same reasons a Beagle wants to chase a rabbit. Additionally, dogs have a keen sense of smell and may be inclined to dig because they sense something interesting beneath the surface. To determine the best solution for your dog’s digging you should first decide on the most fitting reason for the behavior. Listed here are solutions for the most common reasons that dogs dig. Most dogs do not receive enough exercise, which results in boredom and anxiety. If your dog is digging out of boredom, incorporate more exercise into your pet’s daily routine. For certain breeds, digging is inevitable. If your dog has a natural digging drive, the best solution is to provide your pet with a designated digging area, such as a sandbox. 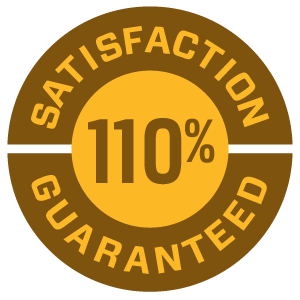 This solution allows your pet to satisfy the need to dig in an acceptable and non-destructive manner. Do not leave your dog unattended outdoors if digging has become a serious problem in your yard. Redirect your dog with a favorite chew toy or to a designated digging area every time the digging begins. 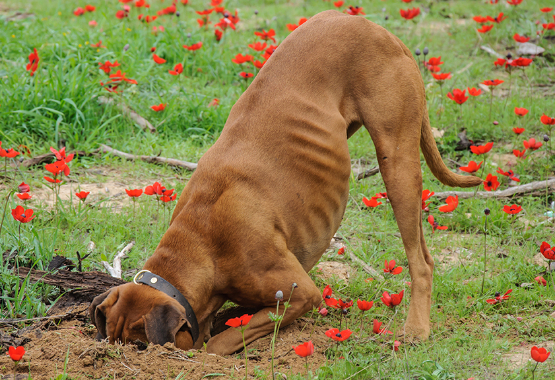 If digging is anxiety-related, treat the source of your dog’s anxiety. Stress and anxiety can be a symptom, as well as a cause, of chronic inflammation. 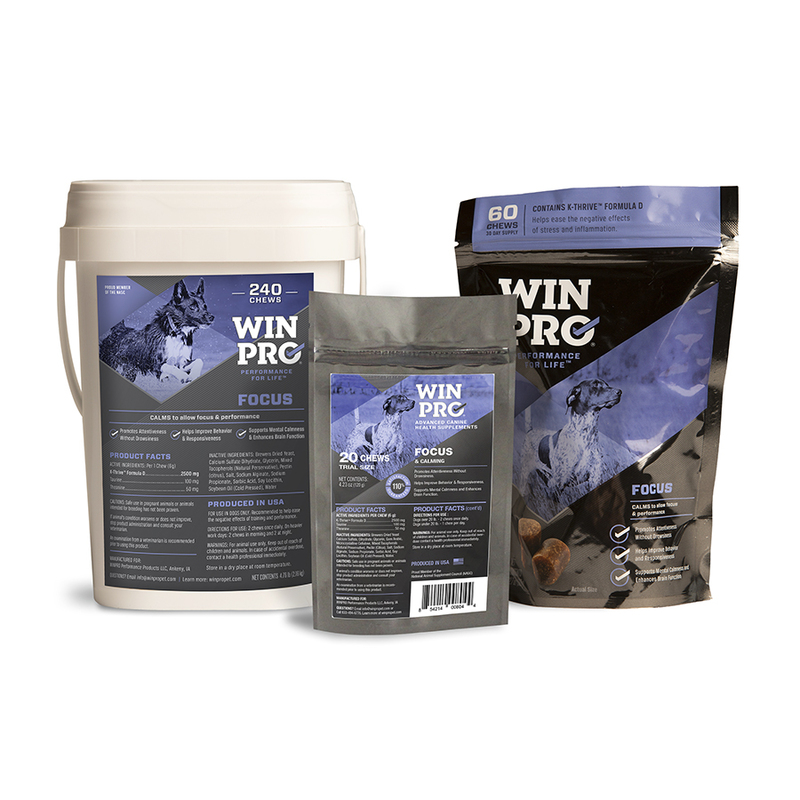 WINPRO Focus is one solution for natural calming. WINPRO focus soft chews contain a blend of blood proteins in combination with taurine and theanine to fight inflammation in the gut to reduce anxiety without causing drowsiness. Most dogs with the biological urge to breed will stop at nothing to escape and find a mate. Spaying or neutering your dog will eliminate this behavior if digging can be traced to breeding cycles.